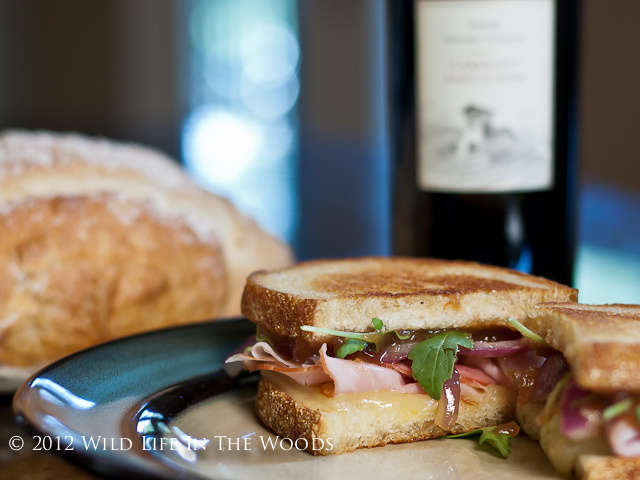 Heavenly Havarti and Black Forest Ham with Apple Butter, Aioli, AND A GIVEAWAY! In the beginning, I made me a fabulous sandwich. Then, a girlfriend challenged me to enter a sandwich recipe contest, and I remembered my sandwich. So, I wrote down the recipe, talked my husband into photographing it, and it was really good. The velvety sweetness of the apple butter, the smoky saltiness of the Black Forest ham, the savory tang of the aioli, the sweet-yet-savory toothsomeness of the caramelized red onion slices, the crisp, fresh pepperiness of the arugula, the creaminess of the Havarti, and the buttery-crisp crunch of the toasted sourdough, all combine together for a mouthful of heaven, that pairs nicely with a glass of Saint Francis Old Vines Zinfandel. Peel and slice a red onion in half, and then cut one half of it into 1/2″ thick, half-moon-shaped slices. Slowly sauté´ in a cast iron skillet, with 1 T. butter, and 1 T. olive oil. Sprinkle with salt and pepper. Allow onion to softly and very lightly caramelize for about 25 minutes. Reserve. Place a large pot lid overtop to hasten the melting of the cheese. Let cook about 3 or 4 minutes, checking the process of the cheese occasionally, as well as peeking at the toastiness of the bread. When cheese is melty and has reached a gooey loveliness, remove both slices of bread from griddle. Now top ham with a smear of garlic aioli, several slices of the reserved caramelized onions, and a handful of peppery arugula. Spread the other side of bread with a thick coat of apple butter. Place slice of bread with apple butter on top of melted cheese and ham slice, apple butter side down. 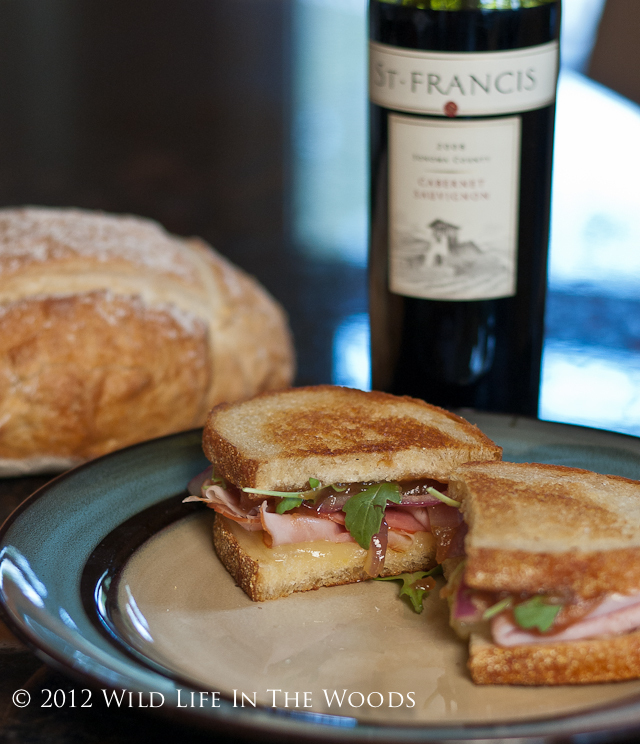 Serve with a glass of St. Francis Old Vines Zinfandel. So, to reward those who already did, and to bribe those who haven’t yet, here’s the deal: if this sandwich ends up in the top ten of the entries, the recipe judges will judge it. And I really want it to be considered. So, I’ve decided to resort to bribery: if you vote for my recipe, you might win some of my husband’s exquisite, home-roasted coffee beans. And trust me, you want to. Vote for my recipe, which is the Heavenly Havarti and Black Forest Ham with Apple Butter, Aioli and Arugula. And then leave me a comment here on this blog, letting me know you voted for my sandwich. On Nov. 14th, I’ll get the Random Number Generator to decide who won the coffee. You must be a resident of the US to win. You can only vote once for the St. Francis contest, and only leave me one comment here. If you’ve already voted earlier for my sandwich, let me know that. and you’ll be entered in my drawing. If you talk your significant other into voting, too, then you can leave me a comment for that vote as well. 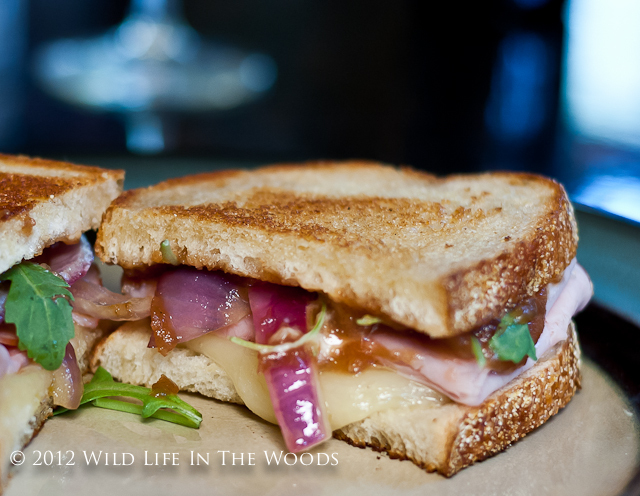 One vote for my sandwich on the St. Francis contest allows you one comment here, got it? Feel free to pin this sandwich on Pinterest, or share this contest on Facebook, or tweet it for me. I’d really appreciate the votes!!! I may not lower your taxes, but a vote for me could win you a lovely cuppa joe! 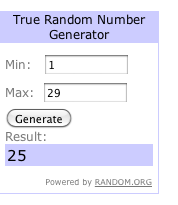 and the winner is comment 25: Terri M.
Terri M, you have 48 hours to get back with me with your address. If I don’t hear from you, I’ll choose another comment.